Camping in New Jersey is literally the best of all worlds. There is just about nothing you cannot do while you camp in New Jersey. You have your choice of over 120 campgrounds and State Park facilities to choose from not to mention thousands of acres of public land to explore. Just about every one of the privates campgrounds in the state have craft activities, pools, fishing ponds, sports activities and so many other amenities I can't even count. Most of them are clean, modern and well suited to just about any type of camping. They are all within a decent driving distance of dozens of cultural, sports, historical, recreational and children related attractions. 1. Atlantic City and its world-famous beach and boardwalk, luxurious casino, non-stop gaming action, the hottest entertainers, the best in dining, and quality sporting events. 2. Revel in bay heritage along a scenic waterfront in Somers Point or visit the landmark mansion of original harbormaster Richard Somers, the oldest home in all of Atlantic County, it remains a museum today. Marvel at the world's only 63-foot pachyderm with a visit to Lucy the Margate Elephant. Or have your children experience their favorite nursery rhythm characters in life size at Storybook Land. 3. There's the 760,000-gallon open-ocean tank at the New Jersey Academy for Aquatic Sciences At Adventure Aquarium in Camden, just one of the fascinating exhibits depicting sea life from around the state. Or Trenton, the nations second-largest state capital in continuous use and the site of one of George Washington's greatest Revolutionary victories. Today, you can visit the spot where he crossed the Delaware and tour the Old Barracks, used by soldiers in the French and Indian War. Or, stroll through the New Jersey State Museum and its impressive art galleries. 4. The Delaware Region is home to most of New Jersey's Pine Barrens, a million acres of preserved forests and waterways. It is, in fact, the largest wilderness area east of the Mississippi. 5. Visit Thomas A. Edison's home and laboratories, where you will see some of his greatest inventions. Stop by a museum solely dedicated to the history of flight. Known as one of the cultural capitals of the United States, the Gateway Region is the home of people from all over the world, whose cultures mingle to produce a rich fabric of life. Here, you'll find theater, dance and the best in classical music. Included is New Jersey's state theater, the Paper Mill Playhouse. 6. Diversity characterizes the many playtime activities you'll find in the Gateway Region, plus being just minutes away from New York City. It houses the Meadowland Complex with its colorful tapestry of sports and entertainment. Restaurants of all types for all tastes, extensive shopping centers with the best of everything, and activities for children of all ages round out a vivid, exciting region. This is truly a gateway to many vacation alternatives. That's why when people experience all the Gateway has to offer they keep coming back again and again. 7. Mention the Shore Region, and certain images immediately pop into your head: over 60 miles of pristine beaches from Sandy Hook to Holgate; surf fishing off Seaside Park; perhaps some bodysurfing off Bay Head; or maybe a moonlit walk in Surf City. 8. On the northern fringe of the Gateway National Recreation Area at Sandy Hook stands the nation's oldest operating beacon, the Sandy Hook Lighthouse. Several miles to the south are the Twin Lights of Navesink, the site of Marconi's first ship-to-shore broadcast. Further south is Barnegat Light; affectionately know locally as "Old Barney," built by Civil War hero George Gordon Meade in 1857. And now the newly reconstructed Tuckers Island Lighthouse in the Tuckerton Seaport. 9. Gentle mountains, Skiing, Rock climbing, and Horseback riding. Can you really do all this stuff in New Jersey? Yes you can - and more can be found less than an hour's drive from New York City. The opportunities of the Skylands Region have always been one of New Jersey Camping's best-kept secrets. 10. If its amusement park that make you happy, check out Mountain Creek in Vernon. Somewhat more genteel diversions can be found during the region's numerous winery festivals or at the Sussex Farm and Horse Show in August. 11. Walk along 30 miles of wide sandy beaches, experience the warmth of a Victorian inn, take a stroll through history and enjoy the fresh bounty of the sea at a gourmet restaurant. 12. All along the ocean, the beachfront towns of the Southern Shore Region offer great fishing, boating, beaches and whale-watching cruises, plus fine restaurants and accommodations - not to mention the wonderful campgrounds in the area, to pitch your tent or set up your RV. 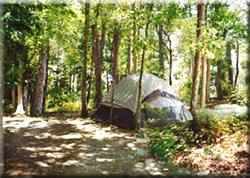 Cape May County boasts itself as one of the premium camping areas of the country. It all adds up to marvelous fun. I couldn't stop at 10 things, I had to give you 12! In this article I just barely scratched the surface of what New Jersey has to offer and it can all be done from the back of your RV or the middle of your tent! Eric Stephenson is an avid camper and publisher of http://www.njcampinginfo.com/. Get all the information you will ever need about camping in New Jersey as well as information about camping and the latest technologies and products related to camping.